The value of canola is derived from the percentage of oil in the seed, the quality of that oil and the percentage of protein in a tonne of meal. Through the Canadian Grain Commission Harvest Sample Program, we know that oil content is going up, quality remains well within canola standards and meal protein content is steady. Canadian canola growers aren’t paid directly for oil content, but higher oil content in general is good for their business. A significant rise in oil content over the past 15 years helps underpin a strong processing industry, which increases marketing opportunities. To be called “canola” oil, the oil must come from seeds of the genus Brassica (Brassica napus, Brassica rapa or Brassica juncea) and contain less than two per cent erucic acid in its fatty-acid-profile. In Canadian canola these past number of years, erucic acid rarely blips much above zero. The bigger factor is overall oil content. Canadian canola, based on data from the Canadian Grain Commission (CGC) Harvest Sample Program, had 45.0 per cent oil in 2017, up from 44.5 per cent in 2016 and the five-year average of 44.2. For comparison, the five-year average for 2000-04 was under 43. 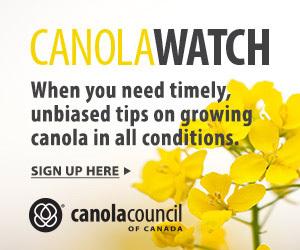 Oil is the high-value component in canola seed. The canola oil average price for 2016-17 was $986 per tonne, based on market statistics posted at canolacouncil.org. The canola meal average price for 2016-17 was $337. If delivered canola seed trends toward more oil and less meal, this has an overall positive effect on the value of canola. CGC also tracks oil quality, including the fatty acid profile, chlorophyll and free-fatty acids. The largest components of the canola oil fatty acid profile are saturated fat, monounsaturated fat (oleic acid) and polyunsaturated fat (alpha-linolenic and linoleic acid). Saturated fat is trending downward. The average was 6.5 per cent in 2017 and the five-year average is 6.7. “Saturated fat is not only lower, but stable regardless of environment. This is a credit to the breeders,” Barthet says. 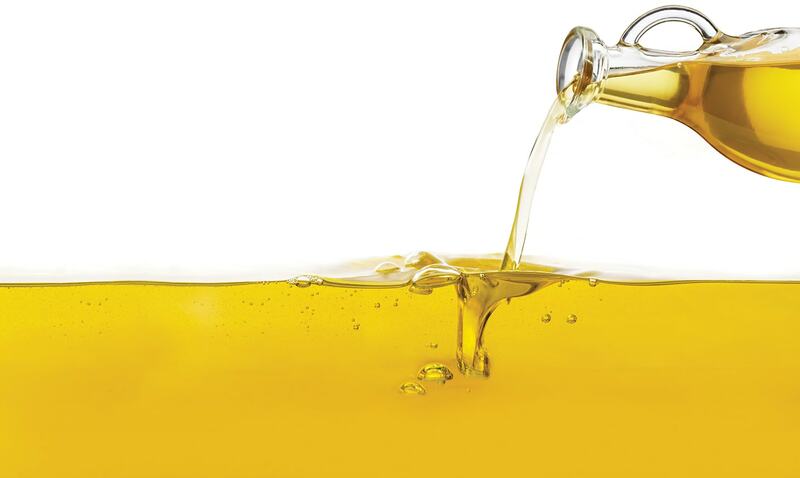 Oleic acid is trending upward; the five-year average is 62.9 per cent. Alpha-linolenic acid content is trending downward; the five-year average is 9.4 per cent. Alpha-linolenic acid, the “omega 3” fatty acid, started going down with the switch away from rapa and decreased again when hybrids took over, Barthet says. 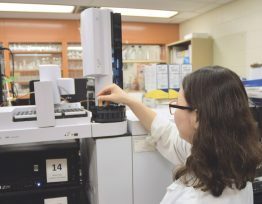 It is still much higher than soybeans, which is good, she says, because alpha-linolenic acid is another pos-itive that differentiates canola oil from soybean oil. Chlorophyll is not usually an issue and is entirely weather driven. No.1 canola cannot have more than two per cent “distinctly green” seeds. Processors use something more precise: They want less than 25 milligrams of chlorophyll per kilogram of seed. In 2017, Canadian canola had an average chlorophyll content of 11 mg/kg, down from 12 in 2016 and 13 in 2015. Barthet says low chlorophyll levels recently are the result of extended fall frost-free periods for most regions. Processors also pay attention to free fatty acids (FFAs) in the oil. These oxidize (go rancid) quickly and affect the smell and taste of oil, so they have to be removed in processing. Processing companies have a cap of 0.5 or 1.0 per cent FFAs on the canola they’ll accept without penalty. This is usually easily achieved. 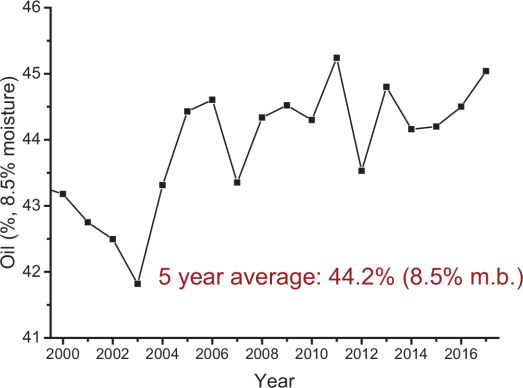 Average FFAs content was 0.17 per cent over the past five years. The trend is flat, but some regions have weather-related blips. Manitoba averages were 0.34 and 0.33 per cent in 2016 and 2015, mostly due to hot summers. Canola spring-harvested in Alberta and Saskatchewan in 2017 also had high in FFAs. CGC research on spring-harvested canola in 2017 found it to be less stable, showing a rapid rise in FFAs after just one month in storage. “For that reason, farmers may want to sell spring-harvested canola right away and processors may want to crush it right away,” Barthet says. Based on the official canola definition, the only requirement for canola meal is that it contain less than 30 micromoles of glucosinolates per gram of air-dry, oil-free solid. Harvest Sample Program averages are well below that threshold. The feed market’s real concern is protein. They want more of it. They don’t care if the seed has less meal and more oil, but they want each tonne of meal to have as much protein as possible. WCC/RRC uses a minimum threshold of 37 per cent meal protein from co-op trial results, which is generally achieved in delivered canola. While feed markets would prefer more protein, there is only so much canola breeders can do. 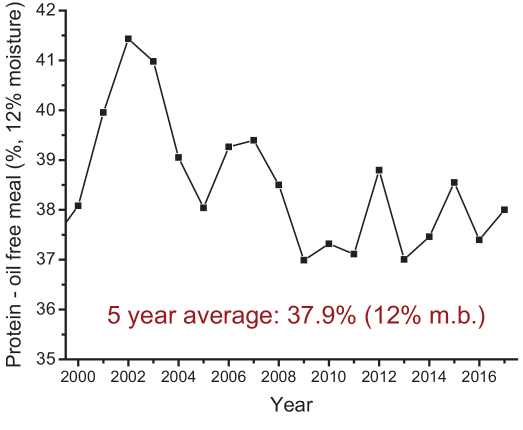 Results from the Canadian Grain Commission’s Harvest Sample Program show an increase in oil content for Canadian canola over the past 17 years. Percentage of protein in Canadian meal is still above the 37 per cent threshold, according to results from Canadian Grain Commission’s Harvest Sample Program, but this is lower than it was a decade ago. What causes oil and protein content to vary? Canola can have a wide range in oil content. As shown in Canadian Grain Commission Harvest Sample Program results, Western Canadian canola had an average of 45 per cent oil in 2017, but the range among samples was 36.9 to 51.2. This is typical. Reasons are mostly related to growing conditions across a region. Hot and dry conditions will see oil content go down. 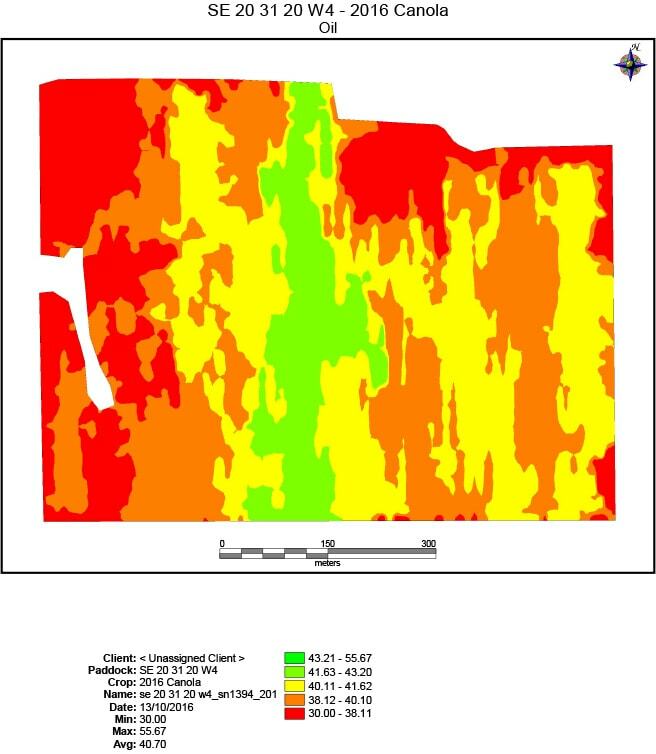 Variation across a field is also significant, suggesting soil conditions, soil quality and fertility are factors. Steve Larocque, owner and lead agronomist with Beyond Agronomy, recently mounted a $28,000 CropScan 3000H on his combine. It uses near infrared (NIR) to measure protein, oil content and moisture every six to seven seconds. He tested it on one field in 2017 on his farm at Morin, Alberta, and the canola oil content ranged from 30 to 56 per cent across the field. The variety was L252 and it was straight cut. Larocque says driving factors can be nitrogen-to-sulphur ratio, temperature during grain fill and subsoil moisture content, but he doesn’t know yet which are the most important factors for oil content. “I have barely begun to dig into the number of variables that can impact oil content,” he says. Protein content is wide-ranging as well. Harvest Sample Program results showed an overall canola seed protein content of 20.1 per cent in 2017 (38 per cent protein in the meal itself), but the range was 14.2 to 29.3 per cent. As with oil content, the reasons for variability are not well understood. Steve Larocque used a new monitoring tool on his combine to measure canola oil content every six seconds. This map shows how oil content can vary across a field. Red areas were as low as 30 per cent oil and green areas were as high as 56 per cent. Dale Burns is a canola breeder with Monsanto in Lethbridge, Alberta. He relies on the WCC/RRC’s canola quality subcommittee to set parameters that meet market needs and industry objectives but are within reason given all the other requirements that farmers have for their canola seed. The Canadian system, which sets long-term achievable standards agreed to by all parts of the canola supply chain, is an advantage for canola breeders, he says. It maintains a set standard while also letting some specialty varieties onto the market. Some seed companies are looking at lines with ultra-low saturated fat content or with ultra-high protein, which could be brought to market through an identity-preserved (IP) program that allows these companies to capture the value of these quality traits. But if WCC/RRC extended those parameters to all canola seed, it would mean less progress on farmer-desired traits, Burns says. “With 24 million acres, canola faces a tremendous amount of pressure from disease, and the industry is looking to rotate resistance genes for blackleg and maybe also clubroot,” he says. “Farmers are demanding straight-cut harvest traits. To meet these needs, we wouldn’t want to raise quality standards above current levels and reduce focus on grower needs”. The Western Canadian Canola/Rapeseed Recommending Committee (WCC/RRC) verifies that all new varieties meet the minimum quality parameters. This is essential to maintain consistent quality for the whole canola crop year to year, region to region. Total saturated fat content must be equal to or less than the mean of the designated unadjusted check(s) in the zone or zones for which the candidate is being considered. (Current checks are 45H33 and L233P). Erucic acid in oil of seed submitted must be less than 0.5 per cent of the total fatty acids. Seed must either contain no more than 12.0 micromoles total glucosinolates per gram of whole seed at 8.5 per cent moisture content or contain levels of glucosinolate not more than the mean of the designated check(s) for regular B.napus plus two micromoles, whichever is higher. Oil content must not be lower than the mean of unadjusted designated check(s) minus 0.6 per cent in the zone or zones for which the candidate is being considered. Protein content must not be lower than the mean of the designated unadjusted check(s) minus 0.9 per cent in the zone or zones for which the candidate is being considered. oil, protein and chlorophyll content for canola. For the CGC, the program provides crop quality data it can share with marketers to promote the sale of Canadian grain. For more on the program, go to grainscanada.gc.ca and look for Harvest Sample Program under the “All Topics” tab.